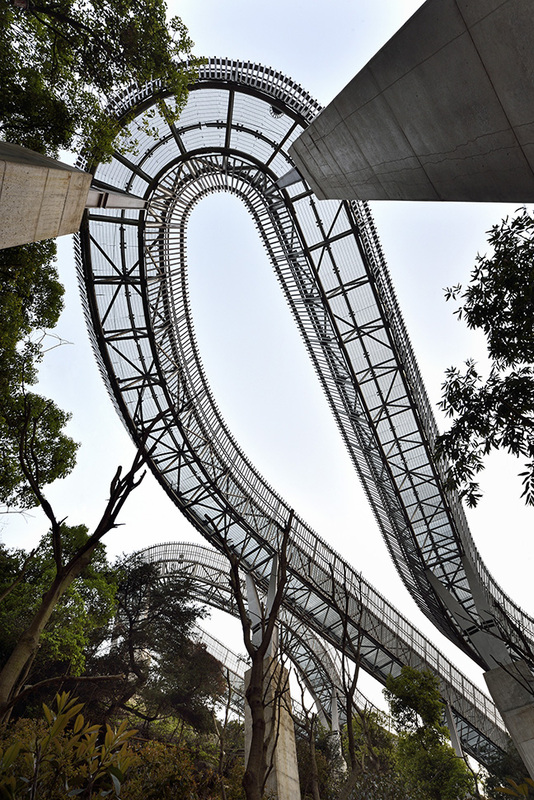 A first-of-its kind elevated steel pedestrian walkway system weaving through forested areas in China, Fuzhou Forest Walkway spans over 6.3 kilometres from end to end, threading through the full breadth of Jinniushan and covers about 19 kilometres along its winding path. 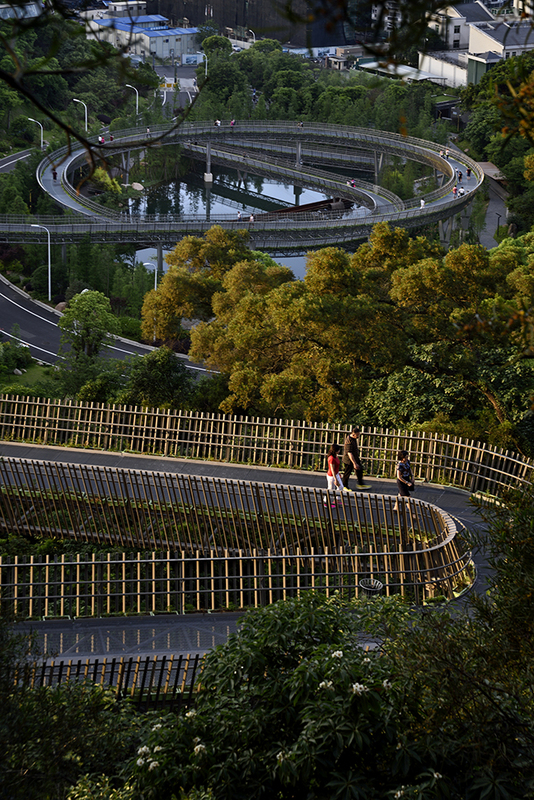 A signature urban connector network that provides public accessibility to indigenous hinterland stretching north-east of Minjiang, Fudao signifies an awakened consciousness to improve lives of city dwellers by bringing nature within closer reach. One of the greenest city in China, Fuzhou is capital of Fujian province, sometimes referred to as Rongcheng or ‘banyan city’, famed for the numerous banyan trees that line its streets. Together with mountainous geography and picturesque man-made lakes, the charm of Fuzhou’s natural beauty is undisputed. Nonetheless, accelerated urban growth has diminished the coverage of forested zones – Jinniushan is one of the larger green lungs situated within downtown. 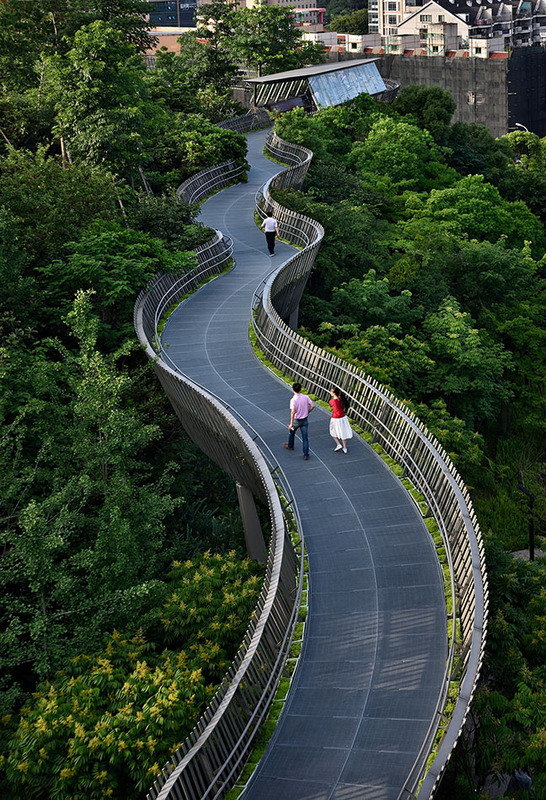 Conveniences such as rest shelters, viewing decks, observation towers and teahouses with washroom amenities are interspersed throughout the elevated walkways, laid at a gentle gradient not exceeding 1:16 for barrier-free accessibility. 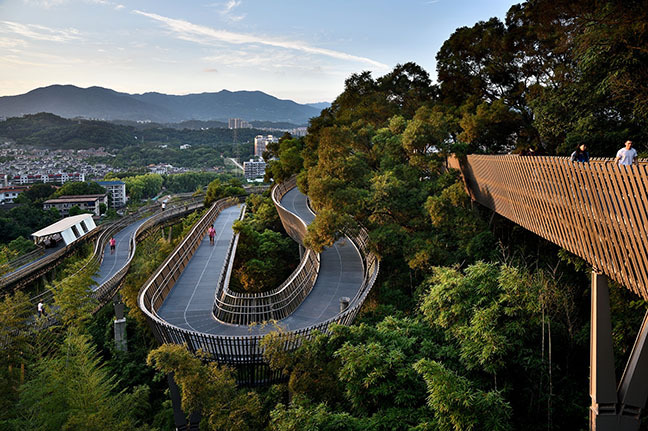 An intelligent walkway network equipped with WIFI connectivity, touch-screen information boards and visitor traffic monitors, Fudao has the potential to set a new national benchmark for eco-routes. 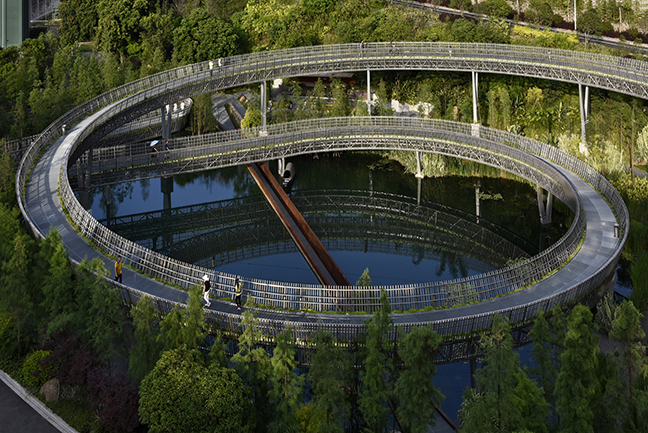 Comprising 8 basic deck components that can be stitched together in various permutations, the walkway network is an all-terrain modular system with the capability of negotiating undulating topography. Efficient design allows for a long span of 14.4 metres between supporting columns, minimizing the construction footprint. This is an important consideration for Fuzhou municipal officials, whom has accorded top priority to the conservation of existing ecology. Use of steel grating for the walkway decks serves to bring natural light down to the ground plane, encouraging low-lying plants to thrive. To ensure seamless connectivity, an overhead bridge straddling across an existing vehicular arterial Honggan Road has been designed, a stunning icon with a column-free span of over 72 metres. The raked profile of parapet screens serves to increase the bridge structure’s porosity, to better withstand high wind loads in the vicinity. Engaging the unique character of the existing site context, various segments of the walkway network add up to an enduring expressiveness. The immense scale of the project has been an eye-opener and the team at LOOK Architects has found the design challenges involved most gratifying to surmount. 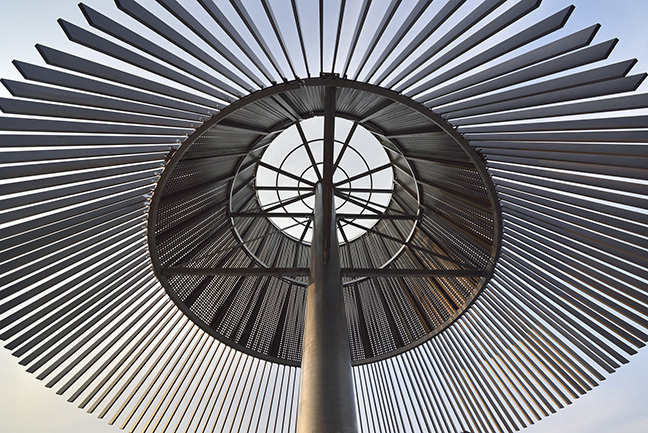 Embracing the philosophy of bettering lives through design, the team has aspired to spread this optimism beyond our shores, and to create a positive impact on future development of the city of Fuzhou.